Are you scratching your head wondering how it’s July like I am? I say this every single year and I never seem to figure it out. If you do, let me know. My Canada Day long weekend was a nice mix of work and play! I spent much of the weekend recipe testing, as I tend to do these days. I nailed down 3 more recipes for the book, which I think puts me just shy of the half way mark – as far as recipes go at least. Other weekend activities included celebrating a friend’s 30th birthday, hiking, running, cleaning/laundry, groceries, and enjoying Canada Day fireworks. Here are some fav pictures from hiking this weekend. We also saw 3 snakes in the span of 2 days of hiking. They were just tiny gardener garter snakes, but in my mind they might as well have been boa constrictors! Not surprisingly, I didn’t get any pics because I was too busy pushing Eric into the snakes so I could save myself from imminent death. I’m not proud. Something I am proud of? These recipes I whipped up for dinner this weekend. Click the link below for the step-by-step photos and the recipes! While it’s been a long time since I’ve featured a new veggie burger on the blog (see: our perfect veggie burger from July 13, 2011), I’ve been testing them behind-the-scenes over the past year and I’ve picked up some tricks along the way. 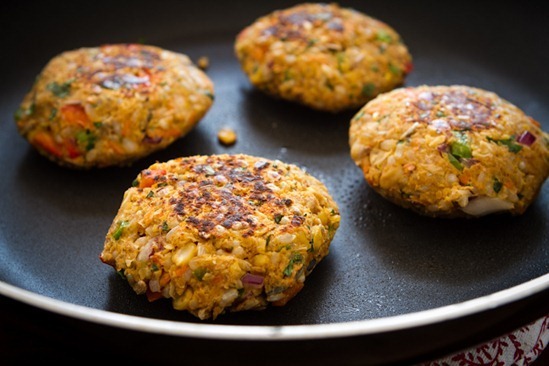 These burgers pack in 6 colourful vegetables, whole grain brown rice, protein-filled chickpeas, ground flax, seeds, and some spices to round it all out. The ingredient list is impressive and the taste is even better. I added my favourite BBQ sauce- Stubb’s – to give the burgers a lil somethin’-somethin’. The “batter” is downright delicious before it’s even cooked. If you don’t want to make patties out of this I’m sure you could just sauté it and stuff it in a burrito. 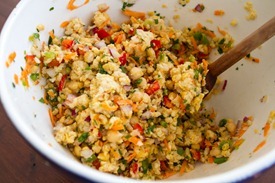 Or scramble it with potato for a breakfast hash…now that would be great. When making veggie burgers in the past, I’ve often used my food processor. While it’s quick, I tend to over-process the ingredients leaving the burgers without much texture (aka: mushy). This time, I decided to chop & mash everything by hand (and give my arms a good workout while I was at it!). They turned out exactly as I hoped. I also cooked the chickpeas from scratch because I digest them much better when soaked overnight in water and cooked with a piece of kombu. If you are short on time you can also use the quick-soak method or simply use canned chickpeas. I’ll explain the options more in the directions below. The trick when making everything by hand is to chop the veggies very small and mash the beans and brown rice until it’s nice and sticky. If you leave the veggies and beans too large the patties won’t stick together, so make sure you mash it up while leaving some chunks for texture. Brown rice is my preferred grain of choice in veggie burgers because of its magical binding powers. It does a great job holding it all together; I’ve found it can work even better than flax eggs. It should look similar to this batter below. It’s sticky, but still has a chunky texture. I think I ate a whole patty’s worth straight from the bowl…! When you shape the patties, really pack the dough in tightly to help it stick. If the patties aren’t holding together you probably need to mash it up more. You could also try adding more breadcrumbs as it will help bind things. These veggie burgers held together great on the skillet. No cracking at all. I haven’t tried them on the BBQ, but I assume they would hold up if handled carefully. Vegan veggie burgers are a sensitive bunch, so take caution if adapting this recipe. If you enjoy Our Perfect Veggie Burger recipe, you should also love of this one. This burger is less dry than the former with more moisture overall. As I mentioned above, you can probably use a food processor to speed things up, just be careful not to over-process the ingredients as the vegetables can release a lot of water when processed. 1. Methods to prepare chickpeas: 1) Soak dry chickpeas overnight, or for at least 8 hours, in a large bowl filled with water. When ready, drain and rinse the chickpeas. Place in a medium-sized pot with 3 cups of fresh water. Cover with lid and bring to a boil. Remove lid and place a small piece (~1” x 2”) of kombu (optional) into the pot with 1/8th tsp salt. Cover again and simmer on low-medium for about 50 minutes, watching carefully after about 35-40. When cooked, chickpeas will be tender and some may have split open. Drain and rinse. Discard kombu. 2) Alternatively, you can use canned chickpeas or 3) the quick-soak method: Add 3 cups water and 1 cup dry chickpeas into a pot. Cover, bring to a boil, and immediately turn heat off. Keep covered and let sit for 1 hour. After 1 hour, drain and rinse chickpeas. Add into rinsed pot with 3 cups fresh water. Cook the same as method 1) above. 2. To cook rice: In a strainer, rinse the rice. Add 1/2 cup dry rice into a pot with 1 cup water. Bring to a boil. Reduce heat to low, cover with lid, and simmer for about 25-30 minutes, watching closely and giving it a stir after 20. Add a touch more water if necessary. 3. Toast seeds: Preheat oven to 300F. Toast sunflower and pepita seeds for about 12 minutes, or until lightly golden in colour. Set aside. 4. Chop vegetables. 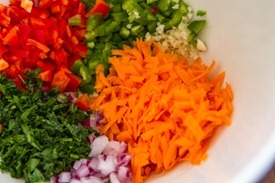 Finely chop the garlic, peppers, onion, and parsley. Grate carrot. Stir in half the salt. Set aside. 5. Mash chickpeas and rice: When chickpeas are ready, drain and rinse. Add the cooked chickpeas and rice into a large bowl. Make sure your rice is HOT as it helps it stick together and bind. Do not use cold rice. With a potato masher, mash very well, leaving some chunks for texture. You will need to use a lot of elbow grease to mash this up, but you want it really sticky so it’s worth it! You can also pulse in a food processor. 6. Mix it all up: Preheat a large skillet over medium-high heat. 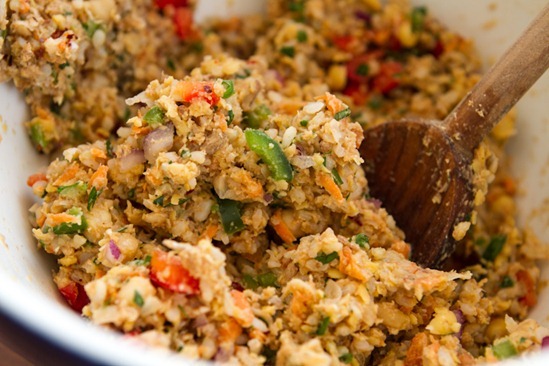 With a wooden spoon, stir in the chopped vegetables into the mashed chickpea/rice mixture. Now stir in the seeds, BBQ sauce, breadcrumbs, and ground flax. Add the salt and red pepper flakes to taste. 7. Shape patties & cook: Form 6-8 patties and pack dough together tightly. Spray the preheated skillet with oil. Cook the patties for about 4-5 minutes per side over medium-high heat (time will vary based on your temp). Burgers should be browned and firm when ready. You can also try grilling the patties (try pre-baking patties for 15 mins in the oven at 350F before grilling). To go with the burgers I also made these amaaaaazing crispy baked fries! I tested a few different methods and this one was by far the best. 1. Preheat oven to 425F. Line a large baking sheet with parchment paper and lightly spray with oil. 2. Wash potatoes and pat dry. Slice potatoes lengthwise into quarters. Slice each quarter in half (or thirds if really large). 3. Grab a small kitchen garbage bag. Add cornstarch and salt inside the bag. Add potato wedges, twist top of bag to secure, and then shake the bag vigorously until the potatoes are coated with the cornstarch and salt mixture. 4. 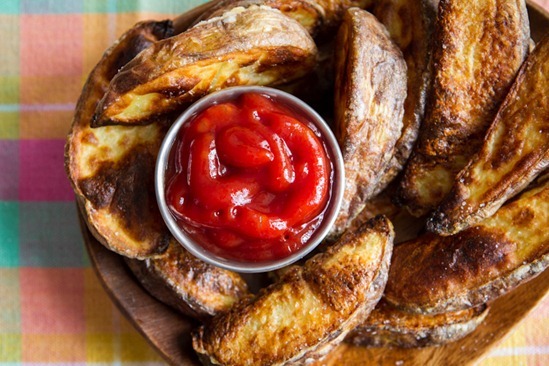 Leave potato wedges in the bag. Now drizzle in 1 tbsp oil, secure bag again, and shake until coated. 5. Place wedges on the baking sheet, with at least 3/4-inch between each one. Spacing them too close together may result in less crispy fries. 6. Bake for 15 minutes, remove from oven and flip each one. Bake for another 10-20 minutes more. We like ours quite brown and crispy so we baked them for about 32 minutes total. Fries will get soft with time so serve immediately. aaaaand last but not least, a pretty Canada Day dessert. I figured it was better to give you a burger & fries recipe today than a Canada Day dessert recipe two days late. Have a wonderful Fourth of July to my American readers! Anyone have any fun plans? Yum, everything looks perfect and perfect for a July 4th celebration tomorrow! I am thinking about eating more vegetarian meals, but I’m single. This veggie burger recipe looks scrumptious and so do the potatoes, but the recipe for the burgers makes so many. My main question is, can the burgers be frozen, and if so, at what stage – before of after cooking? Thank you for posting these recipes. For sure – I suggest freezing them AFTER baking! You can reheat in the oven as you need. Baking from frozen yielded the best results for me. Bake at 400 degrees 15-20 minutes, flip and bake for 10-15 minutes. This is my go-to veggie burger recipe and having frozen on hand makes for such an easy weeknight dinner. YUM! It all looks so great!! I am newly vegan (I’ve been gradually working into it for a few months, but finally completely vegan). I have really enjoyed reading your blog. :) Thank you! Thank you Lynda! That is so great to hear. Yum! Those burgers look great – I’ve just started on a new clean eating diet plan and I think those burgers would fit in perfectly! One of these patties with a big salad or some grilled veggies on the ‘cue will make the perfect summer dinner! I’ve yet to try making any sort of veggie burger but I think you’ve finally got me convinced – this is the perfect new recipe to try out for our BBQ tomorrow! Have a great BBQ! let me know what you think of the burgers if you make them. Oh my goodness those fries!!! I keep attempting sweet potato fries, but they keep ending up cooked by kind of soggy…is cornstarch the key? I’ve heard that you can use the cornstarch trick with sweet potatoes too. I tried it once and I wasn’t blown away by it, but it’s probably worth another try! I used the cornstarch trick exactly as explained above with sweet potatoes, but I probably should have set the oven to broil for the last 1-2 minutes to crisp them up a little more (but I like my fries crispy on the outside). They were still delicious though! MMm it all looks amazing Ange!! I hope all of your fingers are still in tact after that chopping. I know I tend to get a little too relaxed with the knife when I’m making my Detox Salad and I can’t even count the number of wounds that’s given me! I hope your hike yesterday was as good as the one we did on Sunday. 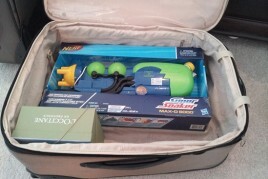 And tell Eric thanks again for hauling the tripod AND scaring the snakes away!! I know it’s amazing I haven’t sliced my finger off yet. Eric tried to guide a snake away from us with the tripod yesterday and the snake turned around and slithered toward us instead! Needless to say, I almost pushed him off the cliff to get away. hah. I keep looking for the perfect veggie burger to make for my meat-loving boyfriend. This one might just be the one – we both LOVE bbq sauce! What does the cornstartch for for the fries? Help the outside to dry out better? Somehow snake skins are almost as scary as the actual snakes! I think the cornstarch helps absorb moisture? I’m really not sure, but it seems to help. Yum, everything here looks absolutely delicious. We have a gigantic can of garbanzo beans we recently purchased at Costco and luckily the rest of the ingredient list looks rather simple… I’m sure I can whip something like this up tonight. Thanks for the awesome post, and those fries look tasty tastyyyyy! I of course knew that you were working on a cookbook, but this post just reminded me and I’m SO EXCITED! You’re such an inspiration to me and I know your book will be amazing. Please never stop doing what you do! Gushing aside, those burgers look amazing. Aw thank you Erika, that means a lot to me! I appreciate your excitement so much. Enjoy your cookout…glad I got the recipe up in time! Hope your hubby enjoys them too. These look incredible! I love your perfect veggie burger recipe, can’t wait to try these! Wow, what a feast! All if it sounds incredible… wish I could’ve been there to taste it all! Happy Canada Day! Thanks, Happy Independence Day to you! I’d probably make those chickpea burgers and save away…or freeze! I’d be curious to see how long they’d last in the fridge. I’d bet they’d also be great over a crunchy salad. Both the burgers and fries look fantastic! I may try them tomorrow as the rest of the family eats bbq meat. BTW: We had your Weekend Glow Kale Salad last night and it was just what I wanted. Delicious! I’m glad you enjoyed the salad Beth…it’s a staple around here. Seriously cannot WAIT until your cookbook! Thanks for thinking of us Americans & our 4th of July parties Angela. Question: Do you ever grill your veggie burgers on an actual barbecue grill? I’ve found they do better on the stove, but that’s just been my experience. I find the frozen, store-bought burgers do better on the grill than homemade. Any one else experience this? My previous recipe (Our perfect veggie burgers that I linked to) were tested on the grill and they held up quite well. I think these would also work, but I haven’t tried it yet. I do find the store bought burgers hold up really well though…they are just so compact! Wow. I LOVE veggie burgers. Love them. I’ve made a few, but they’ve only been “okay”. I even have a cookbook called “The best veggies burgers on the planet” (I have yet to try any of them however. What I *really* want in my veggie burgers is a lot of veggies, and these look like they would really fit the bill. They also look like they have similar ingredients to the brand I buy at Costo. Definitely pinning and trying this one. I think I even have most of the ingredients. The question is, will I have time to try these out before I give birth? Wow, those fries are calling my name! Sounds like you and Ange had a great time hiking. I love the picture of the frog, too cool! 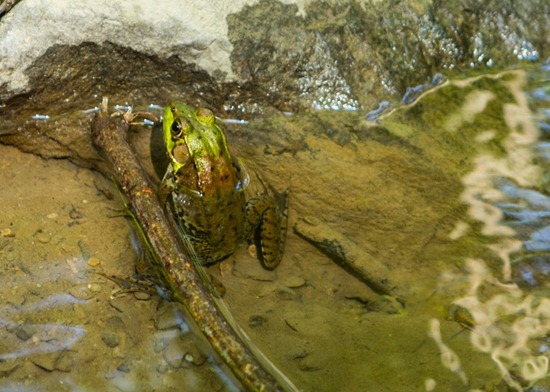 I don’t know if I’ve ever seen a frog hanging out in the wilderness. We hear them outside our window every night but I’ve never seen them hanging out in the neighborhood. Oh my these look amazing, both the fries and the burger! Will definitely be making these very soon, thank you! Those both look so good! I have a big bag of potatoes so may have to try those fries tonight! Thanks! Always love a good veggie burger (slowly thinking of becoming vegetarian – starting with beef – slowly ;)). These look fantastic! But, as I’m not really a fan of rice, I usually don’t have any in my pantry – do you think subbing another grain (like millet/quinoa/buckwheat) and maybe more flax if it doesn’t stick together would work? I’m trying a modified version with Quinoa right now! Will leave a comment about how they turn out. 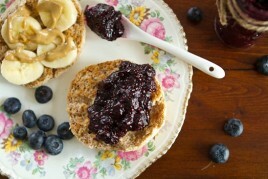 These look delicious , but do you think you could replace the flax with chia seeds? If so how many tbsps? Thanks :-). Holy smokes, this is like the best meal ever especially for the fourth!! I love how you put it in photos for us to follow along too, you’re the best! Happy Fourth of July to you and Eric! 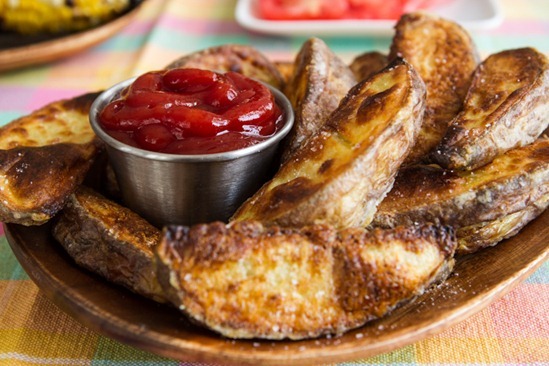 Those potato wedges look AMAZING. Definately going to be trying those soon! And the burger recipe too! I’m planning to go camping with my boyfriend soon and was thinking it would be fun to cook some veggie burgers over the fire along with my carnivorous boyfriend’s meals :) I might have to test this one on the grill at home first! :) Have a great day! the cornstarch/bag tossing method is exactly what I’ve been doing lately and it works like a charm for me too! 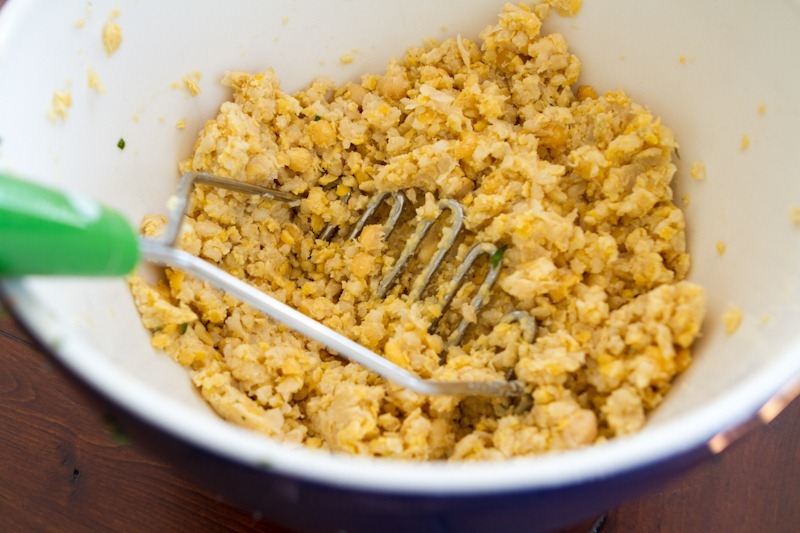 And your burgers and retaining some texture & hand-mashing = KEY! No one likes a pulverized burger. Lol Well at least me… I like some texture. HAS IT SERIOUSLY BEEN A YEAR SINCE YOU POSTED YOUR LAST VEGGIE BURGER RECIPE!!!???? I could have sworn you posted that recipe 2 or 3 months ago. Seriously mystified right now. MYSTIFIED! Wow! That dessert would make a superb ending to any Fourth of July meal….only needs something blue to complete it. Blueberries, anyone? hah yea that’s what I was thinking! I’m saving the recipe for the book though, sorry about that! Lol….can’t blame a gal for trying :) but, I’m sure it will be worth the wait. Love your recipes; the ones I’ve tried have been quite a hit. Good luck with the recipes and book! Yummy those burgers look great but I think I will take a whole plate of fries please! Yum! I love the idea of spicy chickpea burgers, as chickpeas can easily become bland. FYI, I would have pushed whoever I was hiking with into the snakes to save myself too. It’s survival instinct! Hi Angela, What could I use in place of the brown rice or could I omit it completely??? Hey there, The brown rice is a binder, so Im not sure it can be subbed in this recipe. I might suggest millet since it’s sticky. Goodluck! These look like the perfect summer burger! I have a few go to veggie burger recipes but am always on the lookout for new ideas. Yours sounds great. Trying for the 4th! Happy (late) Canada Day! Those burgers look fab – I’ll have to try this recipe. I make bean burgers all the time – also in the food processor. Personally, I like the “dough” on the smoother side and not so chunky. I plan to turn 30 on the 4th! Sigh. But perhaps I should make those burgers to celebrate! Cheers. These burgers look fabulous! Yum! First off, that bean burger looks amazing, I’m definetely going to try it! 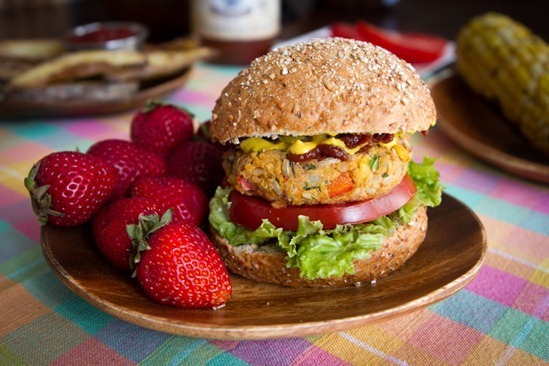 another great veggie burger recipe I have to try!! Love all the veggies in them! Yum! Looks delicious, your perfect veggie burger is already a staple in our household and I’ll definitely be trying these today! I want some of those baked fries right now. Seriously. Yummmmm! Now I am craving a veggie burger! I made your original recipe but actually subbed the black beans for chickpeas as they are easier to get in the UK. Can’t wat o see how they will taste with the brown rice. I am sure hey will go amazingly well with your homemade BBQ sauce recipe! I totally love the hiking! 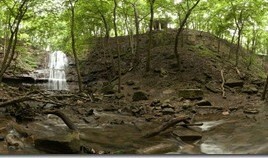 Those hills/waterfalls look like a place back in my Midwest state! 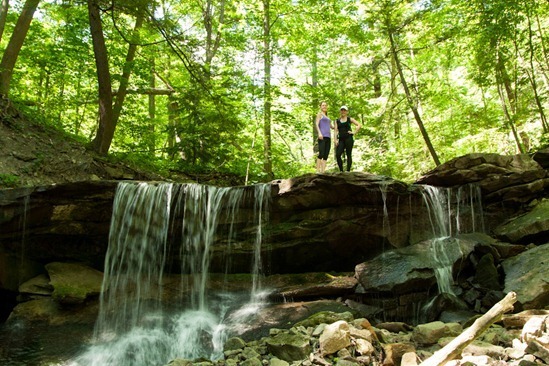 Can’t wait for fall to come, as that’s prime hiking weather! These burgers look incredible! I made chicpea burgers once, but I don’t think they had enough spice. I would love to dig into one of these guys! Starting the 4th with a 10K race and then off to a baseball game. Glad to hear that Tiffany! Oooh this looks delicious! And the dessert does also….will you be posting the Canada day dessert?? Mmmm! I enjoyed your perfect veggie burger so much, i’m sure this one will be just as good! Are they okay for freezing though? This recipe looks so yummy. I really love chickpeas. Are you writing a cookbook? If it contains these kinds of recipes it would be something I would be interested in purchasing. I’ve been leaning toward becoming 100% vegan. I make many vegan meals, but am still in the vegetarian stage. Yes I am..it’s due out in spring 2014. Thanks for your interest! What’s the purpose of the cornstarch on the potatoes? Hahaha, I’m sooooo with you on the boa constricters, I mean garter snakes! Unfortunately here in the Pacific NW, I see a lot of them in my back yard…. and promptly scream and jump on my kids swingset, leaving the kids to scare off the snakes by themselves. Wow! These burgers and fries look amazing! Seriously-how do people settle for a fast food burger anymore with recipes like yours out there?! Thanks for posting! :) Happy July 4th! You are too kind! Thank you. What a great looking spread! Happy Fourth. I am also new to becoming a vegan and I (who never posts) had to let you know your wonderful recipes are the reason I finally was able to make the transition. Every single thing I have tried is wonderful and now no food is wasted. Just had to let you know how delighted I am I found your website and cannot wait for the cookbook. I am much older (old enough to be your Mom); however, I have already had many comments on how healthy I appear after only a couple of months. My labs are now almost perfect and I am one happy camper! Thank you Angela for all your hard work. Congrats to you!!! I’m so happy for you and so honoured that you enjoy the recipes so much. That’s all I could hope for when I post them. Goodluck with your journey…you do sound like your are glowing with good health! Angela- I made these last night for a party and they were fantastic! I subbed the parsley for cilantro (not on purpose, I thought the cilantro was flat leaf parsley:) and it was still great! I also subbed the bread crumbs for some oat flour in the same amount. Great recipe, a new staple! These look delicious I must try. Thanks Angela! Looks super yummy!!! Can’t wait to make these :) Also, on the burger topic, I have a special request… can you please make a beet burger?!?! I had a fav at a restaurant in Houston where I used to live…it was amazing and bright pink! I’ve recently moved and am now in desperate need!!! Here’s to hoping :) Thanks for all your inspiration…my roomie and I make your recipes daily!!!! Happy 4th!! I don’t know why I havent had a beet burger, but they sound yummy. I’ll have to see what I can come up with! I’m thinking golden beets might be nice? Yum. I’m always on the lookout for an amazing veggie burger recipe. Thanks for sharing this! Thank you so much! I tried the burgers today and they are UH-MAZING. You’re a genius! Hey Anna, So glad you enjoyed the burgers! Thanks for letting me know. Also, so cool that you are reading all the way from Jordan!!!! Take care. oh my goodness, i have to try those chickpea burgers! hope you had a good canada day! Well, I made these tonight (I had to substitute chipotle peppers for the jalapeno) and they were great. Held together well when flipped, fairly easy to make and my 3 year old liked them. In other words, a success! Well that is great news! I had no idea they would be kid-friendly too. Enjoy! I made your recipe for fries last night, they were delicious, my husband enjoyed them too. Thanks so much!!! Im happy you both enjoyed the fries! I see snakes while hiking all the time! I have what I call the “snake dance”- which is basically me hopping around on my tippy-toes! And duh- the chickpea burgers look outstanding. i love all of the colors!! I made this for dinner tonight and gosh, it was AMAZING. I will definitely be adding this one to my recipe book. I just omitted the jalpeno as I’m not a spicy fan. Are you still organizing meet-ups? I live in Mississauga and would love to join some time! Thank you for the fantastic recipes… do you have a recipe for the ketchup too? 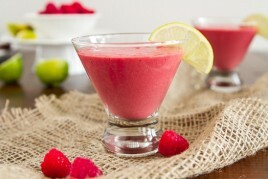 I love your blog, the pictures are fantastic and the recipes even better. I would love to have the recipe for the dessert featured above! I’m American but it looks so good and could easily pass as a 4th of July dessert, or anytime dessert for that matter. Thanks! Hey Holly, I think it’s going to be a cookbook recipe, so sorry about that! just finished your recipe and it tastes really good. It’s not the fisrt recipe that i tried and each and every one of them were great.Thanks for sharing your love for good food! I made the bbq chickpea burgers the other night. They were amazing. They turned out perfect. I baked them in the oven for about 20 minutes (10 minutes and then flipped) and then later in the day we bbq’d them. I brushed them with a bit of bbq sauce and they grilled beautifully. I was careful when I flipped them and they stayed together nicely. I just had a left over one from the fridge and they still taste great two days later. thanks for this great recipe. I have made about 6 different veggie burgers since we started eating vegan a year ago but this is the first one that I have actually liked. I haven’t tried your “perfect” veggie burger yet – that’s next. thanks!! Thank you for your “glowing” review! Im so happy to hear that they hold up on the grill :) I will be doing that this weekend. Take care! I made these last night…SO GOOD! Whenever I make something from your blog, my husband always asks if the recipe comes “husband approved” (like the crispy tofu!). Whether or not these were approved by your husband, these were approved by mine! The best part is…we have leftovers so we can have them again tonight:) I featured these (and linked back to here) on my blog post today – hope that’s ok! Thanks for a great recipe! Funny that you made a new variation. I just made your prefect veggie burger for a tailgate party this week. I’ve never made one from scratch. They really were the best. I’ve never been a big bean fan, but I absolutely loved it. Almost everyone preferred yours over a regular burger. My teenage daughter kept asking if I was sure there was no meat. Thank you! You really have some of the best recipes around. This looks fabulous! I was wondering if you tried the fries with arrowroot instead of the cornstarch? I didn’t know if they would come out the same way, ’cause yours look aMAZing and I”ve been jonesing for some good fries!! I made these chickpea burgers over the weekend and they were divine! Even my meat-eating husband and friends loved it! I can’t wait to make them again. They’re so yum! These were delicious! Thank you for another great recipe. Do you think they would freeze well? I can’t see why not! These were fabulous. 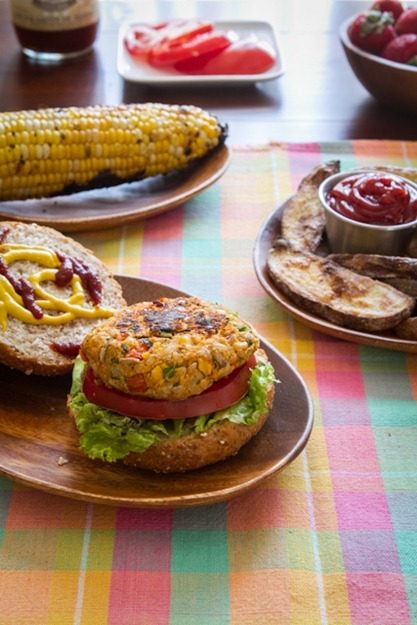 We LOVE your fav veggie burger recipe and these were just as good. I just had one problem: I couldn’t get them to stay together. They fell apart in the pan. Hey Adrienne, Im glad you enjoyed them but sorry they didnt stick together for you. The dough probably needs to be mashed up more if it’s not sticking together. If it has too much texture it won’t hold. Also, pack the dough in very tight when shaping the patties. Goodluck! I would love to try this recipe but I am just cooking for one! Would these patties freeze well? Any tips/hints to freeze them correctly? How long would they stay good in the fridge cooked/uncooked? Hey Heather, I think you can prepare the patties and freeze the raw patties. Then let them thaw in the fridge and cook as usual. Hi! I’m looking forward to making these burgers today! I don’t have any flax seed on hand. Do you think they will work out without them, or should I add an egg? I tried these last week, they were really good and my family all like them. Thank you! I tried these last week, they were really good and my family all liked them. Thank you! Thanks Danielle, that’s great to hear! Made the burgers and they were great… thanks for sharing! Wow! eating at your house must be like living in a restaurant, everything looks soooooooo awesome. gotta say thank you for sharing so many of your wonderful recipes! I just made the burgers! They were very good – despite the fact when “eyeballing” the BBQ sauce a third of the bottle came sliding out unexpectedly… But I suppose it made them all the more flavorful. I also omitted the breadcrumbs because I didn’t have any on hand and it was too hot to home make them. Or maybe I was just in a rush? Either way, as you can expect, mine ended up a bit more “mushy” than yours look – but delicious none the less. I ended up frying half and baking the rest of them (due to the mushy-ness). They were great both ways- and I will definitely make these – and probably adaptations – again! Thanks! Wow! I have never felt compelled to write a comment on a food blog. Your recipes and attitude towards food are inspiring. I love your blog. And these burgers were awesome, thank you so much for sharing! I will be trying many more of your delicious recipes! Hey Annie, Thank you so much! I appreciate your kind words so much. Glad you enjoyed the burgers! So i’m getting ready to make these, for lunches throughout this week, but just realized i don’t have a bell pepper like i thought i did. is there anything i could substitute? Hi Anna, You could probably just leave it out or sub with another vegetable. Enjoy! I whipped up a batch of these this morning to serve at a BBQ later today. I made a few changes: used the food processor to chop everything, increased the bread crumbs to 1/2 a cup (by accident, but it seemed to work), used no-salt seasoning instead of the salt, and used 1/2 can of chopped green chilies instead of the jalapeno (it’s what I had on hand). I can’t wait to serve them to my friends tonight! Those were the BEST veggie burgers I have ever had…. and I can’t believe I made them! Thanks for the recipe and giving me confidence that I can conquer this ever nagging issue of making a veggie burger that doesn’t fall apart. Your food and blog is truly amazing. We are not vegan but I love cooking your recipes so maybe we will work our way towards it! Thanks for this! made the burger and the fries tonight and both were divine! This was one of the first posts of yours that I’d read, and I finally tried the recipe a week or two ago. I was a little curious how they would turn out because I’d never tried to make my own veggie burgers before – they are so amazingly good! I love them! Super tasty. I put most of them in the freezer and just pop one in a to-go container for work for a really quick lunch that leaves me hugely satisfied. Thank you! made the chickpea burgers for supper. we LOVED them. thanks for recipe. I will make the burgers tomorrow, prep and freeze them for later this month. I plan however to put the kombu, diced, in the mixture instead of onions. Would you perhaps know whether the mixture will stick together though? I’m not sure Maria. Im sure if it was really diced small it would be fine! Also, I wouldnt suggest freezing the chickpea burgers raw…as I mentioned in the post I had trouble with them breaking after thawing. I think next time I will cook them all on a baking sheet, cool, and then freeze. I hope to do a post on it soon! Thank you Angela for reminding that they break after thawing! Missed that part… I prepared them almost the same way as you did, using the food processor to blend the chickpeas and rice – it became a VERY sticky dough. Had no trouble assembling the patties, though lost some dough due to sticky fingers! Let them bake in the oven a wee bit too long, I gues (45 minutes, turning a couple of times) but I wasn’t sure what the end result should be. Putting them in the freezer as we speak; will be cooking them later just to give them a crusty touch! I made these burgers today and they were delicious! I didn’t have BBQ sauce so I used sweet chilli and omitted the jalapeno for a less spicy version. It is just starting to get warm here and I will definitely be eating these all summer! Does long grain rice work? I rarely have short grain, but I know it’s stickier than long grain and I hate when veggie burgers fall apart! ok, well maybe b/c I used canned chickpeas and leftover (cold) rice…. my burgers did not stay together AT ALL. It was pretty much a stir fry in the pan after one flip. Disappointing. And I did use the food processor to break it down smaller since it was way too hard with the masher. They tasted amazing, but it was sad all that hard work and then to not be a burger at all. Any tips? Hey Anne, I’m so sorry to hear that! My guess is that it was the cold rice. I think the hot rice really helps it stick together. I will have to note this in my recipe as a tip. I hope the next one goes better for you! Just made these and they are by FAR the best tasting veggie burgers EVER! 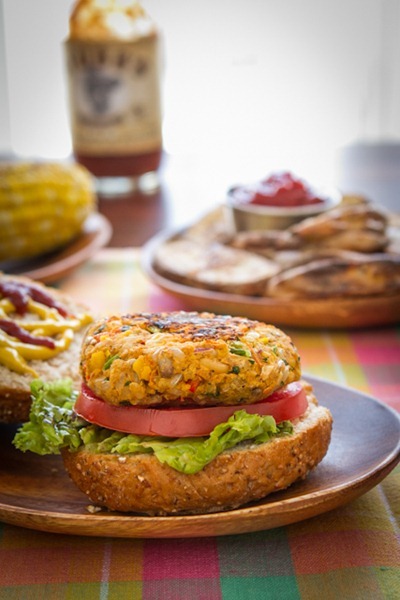 I have made alot of veggie burgers and these are the BEST ones ever! Thanks so much for the recipe! THANK YOU for this recipe! I made these burgers tonight and my husband and I both loved them. It was my first time making homemade veggie burgers, and I was surprised at how easy they were to make and how perfectly they turned out. Love your recipes, love your blog ~ Thanks for everything! I just made these burgers for supper and they are soo good! Thank you for the recipe! Use 1 cup dried great northern or pinto beans instead of chickpeas. Use 4 tbsp sunflower seeds and no pepita seeds. And if I do all that, are there any suggestions you have for me to make them turn out okay? I live in an area where it is VERY hard to get many fresh ingredients or ingredients outside the widely used ones. I made this recently in lieu of my standard black been veggie burgers. I was impressed by the binding power of the hot rice – these really held together better than any veggie burger I’ve made before. The flavor itself was a little on the mild side for my taste, despite the name. Next time I might try to throw in the seeds from the jalapeno. This recipe seems well suited to chipotle and adobe as well. Sriracha would probably do fine in a pinch. The downside to this recipe is that it’s a lot of work, but since it yielded 6 burgers, most of which are in my freezer, at least I’m set for a while. Hi Angela. Can you please share me with me what type of bread/buns you use when you make your sandwiches and burgers? Being that you are a vegan, I was wondering if you have any specific kinds. Hi April, I don’t have a go-to brand yet, but we normally buy bakery buns and just check they don’t have animal products in them. I tried this veggie burger recipe last night… The aroma as well as the flavor were amazing but I did have trouble keeping them together. Needless to say I was a little sad but those fries made up for it. I did use sweet potatoes for the fries and they were fantastic. I wanted to make my own burger buns but have failed to find a good recipe, any suggestions? I made these burgers tonight, they turned out perfectly! so pleased with them, taste great and held together so well. The only thing that was different was the cooking time, for some reason mine took about 30 mins to cook! I am in charge of the weekly cooking projects for my son’s Kindergarten class, and I am committed to keeping each week’s projects in tune with our curriculum and/or what our class garden is producing, as well as keeping it allergy free and vegan, so I do not make anything with gluten, dairy, eggs, nuts, peanuts, or soy. Everything is also non-GMO and organic. This week we contniued discussing America as Our Country, so I wanted to make an all-American meal of hamburgers. I used this recipe as a guide to instead make healthy vegan burgers, and they were a hit with the 5- and 6-year olds! One little girly shyly asked me if she could have a copy of the recipe. We served it with buns, lettuce and organic ketchup. I replaced the BBQ sauce you called for with organic ketchup in the recipe, and didn’t add the jalapeno or red pepper flakes. We cooked them in a frying pan in the classroom, and they were perfect! We also shared one with the principal and other parents because we had so many left over. We doubled this recipe and served the burgers in mini size as sliders, so we had at least 45 burgers to share. I also processed all the veggies in my cuisinart and drained them because so much water content came out. I used raw sunflower and pumpkin seeds, and they were so good. This was my first venture with veggie burgers, and these were perfect! My husband co-teaches with me, and he now has one more fabulous recipe under his belt. Thank you!! I would try your perfect veggie burger, but it has nuts, so it scared me away. If you have a good substitute for nuts, we’ll try that one too. My son can eat almonds, but that’s it. Thank you again! Your recipes are always tried and true. I used a cup of dry oats with a touch of almond milk instead of rice and breadcrumbs, and it worked beautifully. And I baked ’em, too. This recipe is so adaptable it’s crazy. Thanks, Angela! This recipe ROCKS!! These are my favorite bean burgers– very flavorful and delicious. Do you have the nutritional information for this? It helps when adding it to a food diary, such as My fitness pal! I made these for my boyfriend and I this weekend and they were amazing! So glad to have leftovers. Additionally, I did the hand chopping and I am so glad. The texture was superb. Thanks for such a great recipe! What is that dessert? Is the recipe on your webpage? You need to make a cookbook! All of your recipes are delicious…compliments coming from a seasoned cook! OMG these burgers are THE BEST!!!! I LOVE THEM SOOOO MUCH!! I have made them 3 times and every time, I take a bite and cannot stop saying “OH MY GOSH THESE ARE SO GOOD” LOL….omg….I honestly don’t know what else to say but if you are not eating these you are MISSING OUT BIG TIME!!!!!!!!!!! Added some avo and spinach on some Dave’s Killer Bread… OHHHHH MY GOSHHHHHH THE BEST EVERRRR!! Thank you so much for sharing!!!! I made these burgers last night and warmed one up for lunch today. Yum yum! I did struggle with flipping them and may try baking them next time, but I am definitely a fan. I skipped the jalapeno and red pepper flakes due to a co-worker’s delicate palate, but I will spice them up next tim. Hi! Thanks for the recipe!! But I need an answer ASAP! I’m going for the canned chickpea cuz I’m on a time crunch and the directions are confusing me… Do I need to boil them…? I know there’s option 1, 2 and 3 but it read to me that 2 and 3 were the same…? Please get back to me ASAP! Hi Heather, Nope, no need to boil the canned chickpeas – enjoy! HI, I made your burgers two nights ago. They are delicious! Tonight we had them again as leftovers. Ummm..yeah, I did manage to eat a fair bit of the raw mix before cooking also :-) Will definitely make these again. Thankyou so much for the recipe. Do you know if these freeze well? I made the fries tonight for dinner, they were great! I used regular ol’ russet white potatoes, and they still came out very good. 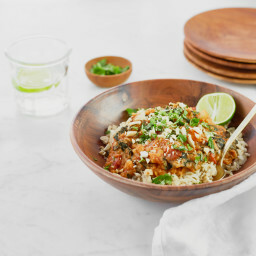 Just about to whip these up today, and was wondering if brown jasmine rice would work okay? I’m really enjoying all the great recipes on your site; the chickpea salad wraps I prepared yesterday were fabulous, and your photographs are spectacular…great job! Hi Linda, I’ve only tried it with the regular brown rice, so I’m not sure. But let me know if you do try it! I just have to say, wow. These burgers were fantastic. My husband and I have been experimenting with veggie burgers, and these were the best to date. He and a friend had gone for a 300km bike ride on Saturday. I made the veggie burgers, some zuchini fries (with bbq saude mixed with dutch mayo as a dip) and a salad with watermelon and feta for dinner. It was all amazing, and these burgers were top. The boys each had 2 and I had one. My husband and I on Sunday had signed up for an Olympic triathlon, so the leftover burgers were a perfect dinner following the race! Thank you. These were amazing. The tip with the brown rice was top. I had leftover brown rice so just heated it in the microwave and it worked like a charm. Thanks again! Angela, I have been a regular reader of your blog for about 4 years now, but I only just now made a homemade vegan burger! It was absolutely delicious, and I added more of a kick by using serrano peppers instead of jalepenos and creating a sriracha ketchup to go on top. Loved it!!! Hi Lauren, so glad you enjoyed the burgers! They are a staple in our house. I love the idea of sriracha ketchup too. THESE BURGERS ARE AMAZING! I’m a new vegetarian and was looking for an awesome veggie burger recipe. I’m picky with veggie burgers and was skeptical about these because I’ve had a lot of bad ones, so I only made a half recipe. I tasted the ‘dough’ before I formed the patties and could not stop eating it! Then I I fried it up all crisp and delicious, and devoured it like I hadn’t eaten in days. I froze the 3 remaining patties and I can’t wait to eat those guys up. Thank you so much for this recipe, you’ve made me a veggie burger believer! I am new to your blog and absolutely love it. Once my summer schedule slows down a bit I have a ton of recipes I want to try. I am looking forward to your cookbook. For these veggie burgers do you think black beans or cannelini beans would work instead of chick peas? Also, what about quinoa instead of brown rice? Yes I think those beans would work fine. 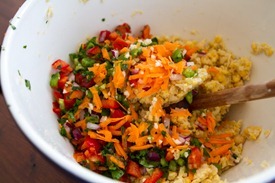 I wouldn’t sub the rice for quinoa though as the rice is used as a binder in this recipe. enjoy! Eating one right now- YUM! I made the baked fries tonight and they were AMAZING! also helpful that they are gluten free with using corn starch :) thank you for sharing!! These look great. I have never had a recipe that worked. One question. I did not understand step six. Do I heat it all up in a skillet and then form patties? These were DELICIOUS! I shared them with my omni parents, who were amazed by how good they were (and each begged to have a second burger). I couldn’t get the burgers to be mush-free, but they certainly were cooked throughout. I did end up cooking them on the skillet for a at least 5 minutes on both sides, if not more, in order to get them firmer and crispier. My son loved the chickpea burgers Thank you so much for your recipes. I love Almond tuna so does my daughter. We made the burgers tonight. They held up so well. You are a genius! We followed your advice about chopping b/c I usually cuisinart everything. This is really head and shoulders above many other homemade and very mushy (though flavorful) recipes for bean burgers I’ve tried in the past from other sites. You’ve got some vegan mojo:) Didn’t add the jalapeno or pepper flakes b/c my daughter doesn’t like spicy so just went with paprika, cumin, and coriander in keeping with the whole garbanzo flavor. We can’t do the regular store bought BBQ so just put tomato paste with lemon, honey, oregano, and salt. Thanks again Angela!! I used some ground rolled oats in place of the brown rice, and didn’t have red pepper or parsley, but these were still totally delicious. Thanks for the fantastic recipe! Made this for a vegan dinner with a bunch of skeptics. It turned out AWESOME! The skeptics all had seconds and even took left over patties home. The recipe works great. I didn’t have/couldn’t find pepita seeds but it didn’t matter. I also did a side of sweet potato fries. I’m definitely keeping this one and going to make it again. Thank you!!!! Is there a recipe for the Canada Day desert? Looks as though its ice cream in a cup of some sort… Possibly a cupcake with no innards? I’m no novice baker – but there clearly is no instructions here…..
Yum! I made the burgers for lunch today! I replaced the rice with lentils! Delicious! And my husband approved too! Made this today (without BBQ sauce) and it was friggin amazing!! I had quite some trouble cooking it and keeping it together unfortunately. I went from cooking it on the pan to baking it but it didnt work. Now that they’re cool they’re firm so maybe they’ll be ok once reheated but either way, I’m so satsfied! The dessert looks amazing! 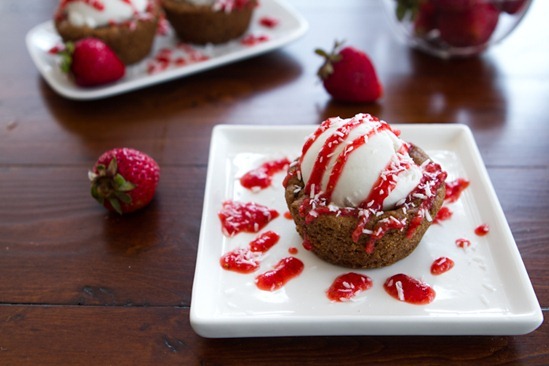 Is it a brownie muffin scooped out & vanilla ice cream with strawberry sauce & sprinkled coconut???? You mentioned in comments about saving for your book. I just flipped through the book but didn’t see – am I missing it? page # ? Beautiful presentation! Where do you get all your pretty dishes? My husband (& me too!) thought the table it was on was gorgeous too!!! Can the mixture/patties be frozen?does it thaw and cook well for future meals? Do you know how many calories are in a party? Hi Angela! Thank you so much for a great recipe! I’ve been looking for veggie burger recipes that aren’t heavy on grains and that are flavorful, and these worked so well! I made a double batch and froze a bunch of them. They’ve been fantastic as a quick grab from the freezer when needed. I don’t defrost first, just take them straight from the freezer and reheat them in a 350 degree oven for about 35+ min, depending on how crispy I want the outside. They come out perfect! Could these be baked? or do you have any other recipes for vegan burgers than can go into the oven? PS so excited and happy for you and your family!! Please keep us posted. I love this recipe! I added some black and white beans to the mix. So times I like pan frying it into a ground beef type texture and stuffing it into wraps. So tasty! I just made this recipe top to bottom! Delicious!!!! I left out the pepper from the burgers but they really held together AND I have a ton leftover that I froze! Made these fries tonight for dinner. They are so good, and a big hit. Will be making these again for sure. I made them with the arrowroot powder like in your cookbook. I am so glad I ordered your book, there are a few things I really want to try in it. OH MY GOD! I just did them and they are SO delicious!!! What a great recipe! This is gonna be a regular one. Thank you so much for these amazing (vegan) recipes! Just tried these burgers-delicious & a great blending of flavors! My husband loved them as well and he is quite a picky eater. I was skeptical about a veggie burger incorporating seeds but they added a nice crunch. I cant wait to try this. Chickpeas are my fav, I promise. Ive been craving a homemade veggie burger, instead of hiting up my vegan spot daily. Why discard the water the chickpeas were cooked in? Save it and use it as aquafaba for meringues instead of egg whites. Made the fries tonight….major craving…but i skipped parchment paper thinking they would be EVEN crisper. …DO NOT SKIP THE PARCHMENT!! oh man. When the time came to flip they were stuck to the baking sheet. Very very stuck. Now….i was still committed to eating them…so I managed to scrape them off and somehow salvage a “french fry casserole” :) still delicious. Lol. Your recipes seems very easy, as I have most of the ingredients you are using. I am diabetic and seriously looking for vegan recipes to help with controlling sugar levels, I will use Quinoa and Oats instead of flour, but I am sure I would love eating these a lot. Thank you so much for sharing . Hi there! This fries are amazing, really really tasty. I used to use so much more oil when I made oven potatoes before…anyway, I just wanted to tell you something amazing I just discovered: I had some of this fries left over from yesterday and I just throw them (thus the old, cold, soft fries from yesterday) together with some vegtables and a bit olive oil, garlic and spices and throw them on the barbeque! They were really really good! So next time, if you have some left over, don’t throw them away :)! I made this for Dinner this week and tonight, I had one with vegan mayo and ketchup with a sandwich thin. After one, I just had to have another. So good! I was able to get 6 1/2 patties out of the batter. Excellent recipe! There are a lot of steps involved but worth it. I love this recipe!!!! I put the whole mix into a lightly oiled baking dish press it frimly, glaze with more BBQ sauce mixed with hot sauce and bake for 45-55 mins at 375. Turns into the perfect ‘meatloaf’ for a Sunday night dinner. Thanks Angela!! We just made a double recipe of the burgers and fries! Thank you for the pictures and step by step instructions!!!! Both were amazing! The double recipe made 19 burgers at 76 delicious calories each! This recipe looks delicious, and using canned chick peas appears to make it accessible even for the ‘cooking challenged’ like me. For at least a couple of years I have been flirting with the idea of going vegan. Even as a man, I have never been a big meat eater, though when presented by a well prepared, succulent meat dish I’ve indulged as much as the best of ’em in the past. But preparing raw meat on my own has always rather grossed me out, for reasons I’m sure need no explaining to those who frequent websites such as this one. In the last while the plight of farmed animals (particularly factory farmed) has really gotten to me, to the point I’ve been asking myself if I could eliminate their products from my diet. Then the dread set in. Get rid of most, or all meat from my daily meals? Not easy, but that sounded do-able. But then I started thinking of all my favourites in other categories—cheese, eggs, milk, etcetera. Gads! What would I do without my open face broiled cheese on bread for a quick tea time / meal? Or milk! I *love milk, and it seems to go particularly well with certain foods for which I’ve never needed to try a substitute. A life long favourite of mine has been a nice hamburger (on a bun). I could eat them at least twice a week and not get tired of them. Discovering the concept of veggie burgers has at least assuaged the sinking feeling in the pit of my stomach that has come from pondering how on earth I’m going to find ANYthing to eat besides salads if I do take the plunge and go full-on vegan. And this recipe sounds both tasty and not too hard to make. In my introductory reading on veganism, I read somewhere that one thing people think they’d miss most when going vegan isn’t just the non-vegan foods, but rather their textures. I agree. If one can tuck into a nice veggie burger that has the ‘tooth’, or texture and density of one made from meat, or if one can make some other sort of meat-patty-esqe-like foods so that the supper plate has a more traditionally presented fare (potatoes, vegetable and ‘meat-like item’), then the whole veganizing of oneself might not be as impossible as it seems from the outside. Wish me luck, and thanks for the nice recipe! Hey there, I can’t thank you enough for leaving such an inspiring note! I think it’s an awesome goal, and simply taking steps in that direction makes a huge impact! I’d love to hear how the recipes go, and don’t hesitate to let me know if you have any questions about them! Happy to help.